They offered us (lowyatians) a 6 months free trial (Yeah no strings attached) to test the service out fully and provide feedback on how to improve the service. 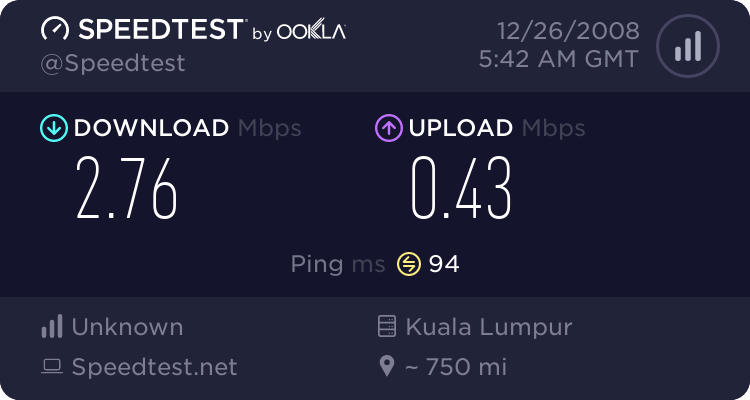 Not so bad.Plus this is the first time I’ve seen an ISP that listens to users and has respresnttaive to answer users questions and doubts in a message board – Wish our Streamyx did that , at least there is someone to listen our rants and cries and not to mention our screams ! Anyway , here is picture of me with the whole thing (Thanks miss Naomi for sending the picture). Yeah I guess you’ll see that picture somewhere as well. But for now its at my blog. Ah Yes The Box - Its pretty small ! The modem looks huge but honestly I was fooled by its size. Its pretty small and actually it fits in your hands perfectly. Oh yeah here is the picture of the modem *up close and personal*. I’ve seen several modems before for Wireless , this includes Jaring’s Wireless , Time Webbit and Maxis ZTE MF600. But so far this is the smallest modem that I’ve seen for WiMax. Naomi told me that they are coming up with a USB Dongle for mobile warriors and such. This is great news especially if you travel a lot ! Lets take a closer a look at the modem. There are 3 main indicators , one for the power indicator , the other one is the indicator for network and lastly you have three L.E.Ds (red , yellow and green) which tells you the signal strength of your connection. Green is for good connection and red is for ‘bad’ connection. For techies out there , P1’s modem doesn’t give you the technical stuff as in how strong the signal in terms of dB (aka the RSSI) and what are the noise level. So you may be disappointed bit with that. Hopefully they’ll do something about it , maybe by allowing ‘power users’ to check out the signal rating. Think of this as feng shui , for some people they may need to get these values to find a suitable place where to put their modem. Remember people , even if you tilt a modem a bit it has an impact on your connection speed as its Wireless. Placement of the modem is very important in this case. Quick Speed Test – This is a quick speed test that I’ve conducted today. I am comparing it against my 2Mbps streamyx. Please keep in mind that at the time of testing , my family members were using the streamyx connection , so it may not reflect the ‘actual’ speed that I am getting. Let see how it performs ! By the way , feel free to comment here , on what you think about my review and such. Oh if you have comments to P1 too , post them here. I am sure that they have their represnetatives to read or I could direct your quires to them ! They said that the WIMAX coverage is max 2KM radius from the transmitting point. How true is this? As far as I know, Wimax can go further. I just subscribe to their service and by using a GPS I gauge the distance between the tower to my house which is 1.6KM away. I get a very poor coverage except on the second floor of my house. Some more have to be a fix spot only it will get the coverage. I manage to borrow the modem from my friend to test it and once I got the right spot, immediately I use a permanent marker pen to mark the spot. To my surprise I get a green light which means full bar. If I shift it to other location, there are no coverage at all. I guess it must be utilizing point of sight or straight line for the service to reach you. So far I am very happy with the service vs. my Celcom and Maxis HSDPA which practically crap around my area as I stay very near to the hill. Even mobile phone service coverage also very difficult to get. Well it certainly can. I think they are just limiting it to ensure that customers don’t complain if they get slower speed and such !